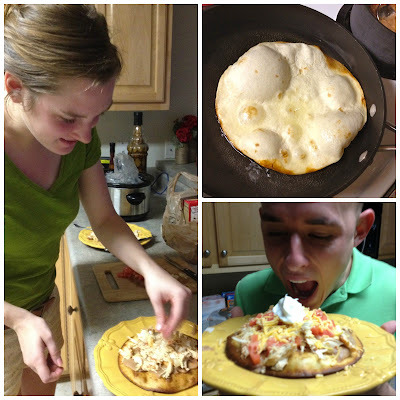 I found this recipe on Pinterest and thought it would be a fun little spin on the typical taco night. I followed the recipe about as well as Jenny follows directions when there are other dogs around (not well), but the beauty of these tostadas is they can be prepared six ways to Sunday. Parker and I both thought they were delicious, and they were super simple for me to prepare. I didn't really want leftovers, so the following measurements will make two large tostadas. *avocado, shredded lettuce, hot sauce, lime juice, etc. would all make wonderful toppings too! 1. 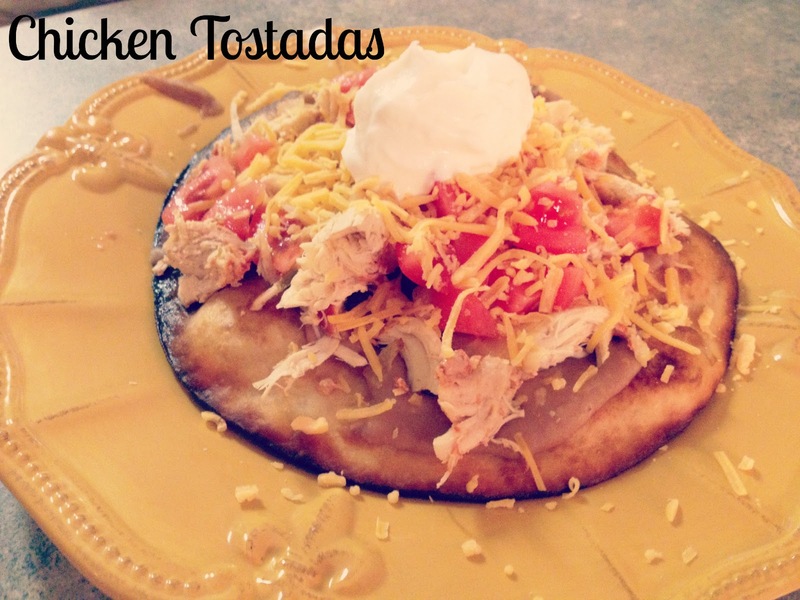 Place chicken in crockpot and cover with salsa. Cook on low 4-6 hours, or until cooked through and chicken shreds easily. 2. Heat peanut oil in skillet until hot, and place tortilla in oil. Heat until the bottom is golden brown, and flip tortilla with tongs. Repeat until both sides are golden brown and place on paper towel. Be sure to watch the tortilla carefully. After about 20-30 seconds, it will burn. If you've never fried a tortilla, it fries quickly and is neat to watch! 3. Sautee diced onions until translucent, remove from heat. 4. Pour refried beans into a small pot and cook until mixture thins slightly and is heated through. 5. 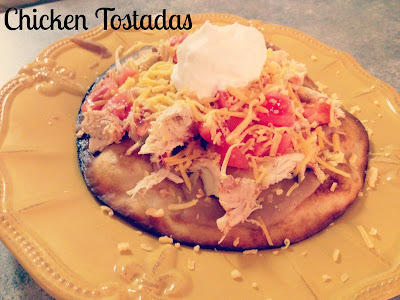 Garnish tostadas with refried beans, chicken, tomatoes, onions, cheese, and sour cream. Serve and enjoy!